The heroic NYC-based promoter of interesting wines, Paul Grieco, instituted a promotional campaign several years back called Summer of Riesling. It started as an effort within his Terroir wine bars, to serve only Riesling by the glass all summer. Grieco says he was tired of wine-industry influencers only telling a skeptical public how great Riesling is, so he set out to actually show it. Summer of Riesling has since become a marketing phenomenon, with incentives for restaurants and shops across the country to focus each summer on the glories of Riesling. Glorious. But the danger with any such promotion is a well-intentioned ghettoization of the object of adoration. Saying that Riesling is the ideal summer wine is like saying Alice Munro is a great female writer. It’s true but incomplete. Riesling is the ideal wine for autumn and winter. This is because it is the ideal wine for food, and in autumn and winter what we do is eat. We eat foods with more sweetness and heft, and so those German Rieslings that reflect this (i.e. not the completely “dry” ones) are best. Fact. While there’s the constant risk of dismissal from dry-wine-hounds (the right wing of Riesling-ignoramuses), German Riesling-with-sweetness is threatened by disparagement from a left wing as well. This left wing is that younger set of oenophiles: experimental, engaged and ever on the lookout for the next cool thing. Riesling was a cool thing a few years ago, according to the unspoken prejudices of this sect, but now there are other cool things: Txakoli, Jura, Arneis, Vitovska, Manzanilla. As a vinous left-winger myself, I’m happy to be living in a time of such catholic tastes, with increasing availability of previously under-known wines. But wine exploration, as thrilling and even life-altering as it can be, should be a series of expansions, not a series of trends. Just because you used to “be into” Riesling and that allowed you to get into Gruner Veltliner doesn’t mean you leave Riesling behind! And let’s be flat-out meritocratically honest here: I love Manzanilla and (some) Vitovska, Gruner and orange wine. (Arneis almost never). But Riesling is better. It is a truly great wine, a noble wine, a timeless wine. Yet no other great, timeless wine wears its greatness and timelessness so lightly, so charmingly. These are the easiest wines in the world to love, if you enjoy a well-made cocktail, or apples, or sweet potato fries, or pad Thai, or gazpacho, or braised meat, or dessert. All those foods — and billions more — have sweetness in them, balanced by something else. The interplay among sweet, sour, spicy and salty is what makes those foods the ones we love. To ask wine to reflect merely three of those four components is ignorant and insulting. On a recent professional trip to Germany, I visited winery after winery that focused on dry Rieslings. Some were excellent, most fine but disappointing. Not disappointing because the wines were not good, but because a ghost was present, a sign that something living had died. The dry wines mostly told me that they had failed their birthright, not quite fulfilled their potential. As befits the current attitude in Germany, most of our meals were accompanied by dry wines. But there was one meal that stood out, at the great Zum Krug restaurant in Hattenheim, because of the pairing of one dish with a Spatlese Riesling. The dish was at a high level. I wouldn’t try it at home. I offer it as an example of how all of this works, the mechanics of Riesling’s sublime sympathies with food. Roast venison with herb gratinee in wine butter, with walnut potato terrine, raisin-and-Riesling-flavored speck (smoked prosciutto), and honey carrots. The wine (not available here) was a village-level 2006 Spatlese from P.J. Kuhn in the Rheingau. It wasn’t extraordinary wine, but it was very, very good; the seven years of bottle age had brought it up to pre-adolescence — in 15 years it will be prime. What was extraordinary was the meeting. Reread the details of the dish: Every one of its flavors and textures — gamey, nutty, smoky, herbal, unctuous, caramelized, balsamic, salty — was echoed in the wine. I simply don’t know of another sort of wine that could have done this. (The course was also served with a terrific Spatburgunder (German Pinot Noir), but no one paid it much mind). With Riesling, you don’t have to roast a young deer and produce a walnut potato terrine to get this sort of magic. With a mid-level Kabinett, a simple gingered chicken soup will come alive. A ham-and-cheese sandwich with mostarda or chutney simply soars. German Riesling is (dis? )organized by all sorts of classifications according to ripeness of the grapes at harvest, amount of residual sugar in the final wine, location, acidity and more. Vintage variation is crucial with a grape so attuned to terroir, but there hasn’t been a “bad” year for some time, so you’re safe; you’ll just sense so much variety depending on year. Read the alcohol level on the wine to get a sense of how sweet it will taste. This isn’t sure-fire, but it works quite well. A Riesling with 12 percent alcohol will be totally dry; with 11 percent there’s a hint of sweetness, though barely. Kabinetts, unless labeled “trocken” (dry), usually contain 8.5 to 10 percent. Spatlese levels are usually even lower, but with some age the wines will present less as sweet than as profound. You might come across other designations (“feinherb,” “halb-trocken”), but for now ignore them. Forthwith, a short list of excellent wines, not in any way complete. It’s just a useful introduction to exploring the world’s greatest wine category. St. Urbans-Hof Ockfener Bockstein Kabinett 2011 ($19, Central). A textbook Mosel, slatey, smoky and floral. Want to know what happens to a lovely Mosel Riesling from an exceptional vintage as it matures? The S.A. Prum Blue Kabinett 2007 is available for just $18 (Nappi). Three years ago the fruit shouted jubilantly; now this golden wine’s sweetness barely whispers; the stones and clean branches carry the day. Donnhof Estate Riesling 2011 ($22, SoPo). From the Nahe, the most geologically varied wine region anywhere. The wine’s importer, Terry Theise, has a bias, of course, but he says this is the “single greatest white wine value in the world,” He has tasted more wines than I have, but this wine makes me babble incoherently. It’s a poem, a soprano ode to joy. It ripples, drapes, and lingers. Donnhof is a Great One. Start with this wine and then try the maple-walnut Kreuznacher Krotenpfuhl Kabinett for a few bucks more. 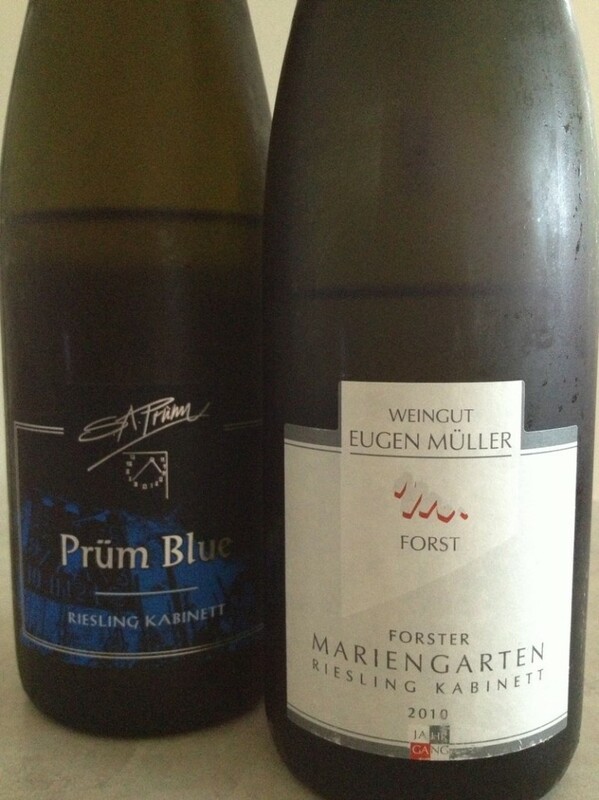 Eugen Muller Forster Mariengarten Kabinett 2010 ($17, SoPo). This is from the relatively warm Pfalz region, from a year with both insanely high acid levels and equally chart-topping ripeness. Many 2010 Rieslings don’t manage to balance those poles; this does, in dramatic fashion. Jam-packed with spice and sunshine, agave, just ravenous, and if you don’t like your Rieslings quite so flinty and sharp-tongued as you get in the Mosel, this is your guy.